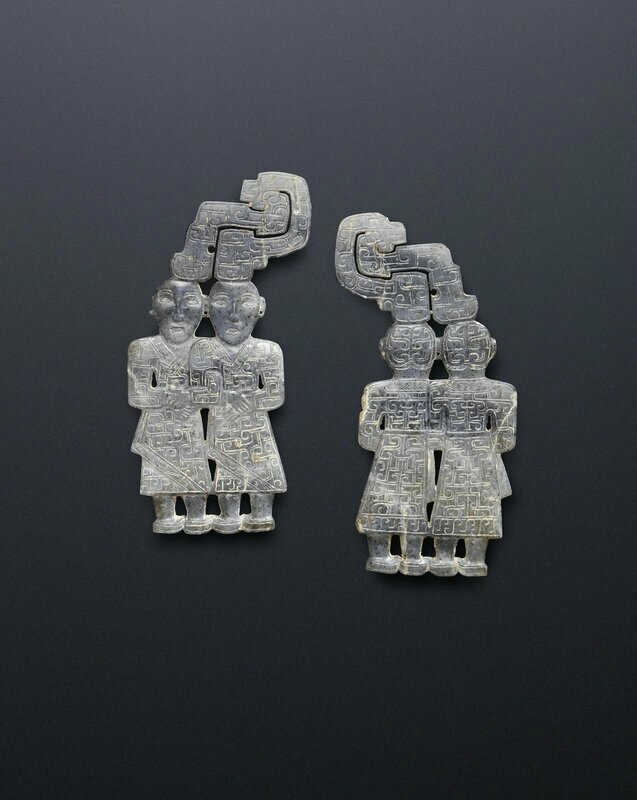 Lot 22, A very rare pair of grey jade 'twins' pendants, Warring States Period or later. Estimate HK$ 400,000 - 600,000 (€46,000 - 69,000). Photo Bonhams. Comprising two pieces to be fitted back to back, each carved flat and in the shape of a pair of twins standing side by side and locking arms, wearing long sleeved robes intricately decorated with a dense ground of finely incised interlocking scrolls above boots, surmounted by tall elaborate scroll forms above their heads pierced with a small circular aperture, the somber faces featuring thick eyebrows, large incised almond-shaped eyes and small mouths detailed on the front piece, with hair depicted parted down the middle on the back piece, the stone of a light grey tone with small darker grey flecks. Each 11.5cm (4 1/2in) high (2). 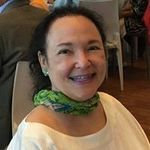 Notes: Early jade carvings depicting humans are rare and appear only intermittently as burial objects from the Neolithic period to Han dynasty. 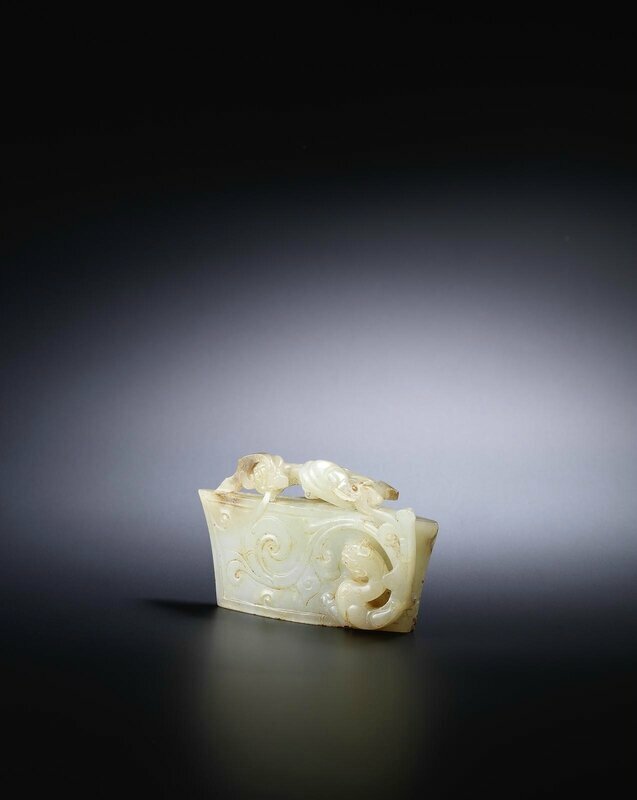 During the Eastern Zhou dynasty and following into the Han, human figures in jade were principally in the form of ornamental beads and pendants. The use of human figure motifs in a predominantly decorative context is a discernible departure from the more ritualistic or religious aspect related to the Neolithic period, Shang or Western Zhou dynasty tomb jade or bronze figurines. This change to the more functional and secular corresponds to the use of figures as supports for bronze frames and lamps, such as those excavated from the tomb of Marquis Yi of Zeng. See J.Rawson, Chinese Jade from the Neolithic to the Qing, London, 1996, p.281. While no figural pendant of the same decoration appears to have been published, elements of the design are comparable to extant figures. Consider the similar facial expression on a jade standing figure, with related almond-shaped eyes and a rounded nose carved in relief, Warring States period, in the Grenville L. Winthrop collection, in the Fogg Art Museum, Harvard University, accession no.1943.50.329. For an earlier dated example, see a jade figural pendant, Western Zhou, excavated from the tomb of Marquis Jin, currently in the Shanxi Provincial Institute of Archaeology, illustrated by Gu Fang, The Pictorial Handbook of Ancient Chinese Jades, Beijing, 2007, p.126. Compare also with a jade figural 'twins' pendant from an assemblage of pendants, beads and gold chain, Warring States period in the Freer Gallery of Art, accession number F1930.27a-k. The ground of scrolls on the present lot also parallels the character of various cloud scroll patterns frequently incised on the period's bi discs and dragon pendants, albeit in a more elaborate fashion: Compare the thickly incised cloud scrolls on a jade 'dragon' pendant in the National Palace Museum, Taipei, illustrated in Art in Quest of Heaven and Truth – Chinese Jades Through the Ages, Taipei, 2012, p.98, pl.5-6-13; and a jade disc incised with a design of geometric cloud scrolls, illustrated in Compendium of Collections in the Palace Museum: Jade 3, Beijing, 2011, p.116, no.111.